Tipard TS Converter is professional TS video converter which can assist you to convert TS video files to various popular formats like MPEG, VOB, DAT, MP4, M4V, MTS, WMV, ASF, MKV, etc. You are also able to improve the output video effect by editing functions. Why choose Tipard TS Converter ? Tipard TS Converter can convert TS files to MP4, MOV, M4V, FLV and other formats for your iPod, iPhone, iPad, and other popular portable devices. It also can assist you to edit the converted videos according to your preference. Tipard TS Converter is well designed for users to convert TS files to AVI, MP4, WMV, 3GP, 3GPP, MKV, FLV, SWF, VOB, DV, even HD videos files, etc. And it also can convert TS to MP3, WMA, OGG, MP2, AAC, M4A, WAV, AC3, etc. So, you can get MP2, MP3, WMA, OGG, AAC, M4A, WAV and AC3 audio from TS and other videos or audios for your music enjoyment with the assistance of Tipard TS Converter. This TS Converter also accepts MTS, M2TS and other popular video files as inputting file, as well as converts videos to TS. As its abundant supporting formats, the TS converter supports converting files to many fashionable devices, such as iPhone XS/XS Max, iPhone XR, iPhone X/8/8 Plus/7/7 Plus/6s/6s Plus/6/6 Plus/5s/5c/5/4s/4, iPad Pro/Air 2/Air/mini 4/mini 3/mini 2/mini/4/3/2, iPod Touch/Nano/Classic/iPod, etc. With Tipard TS Converter, you can remove the black edges around your movie video and customize the aspect ratio for better enjoyment. 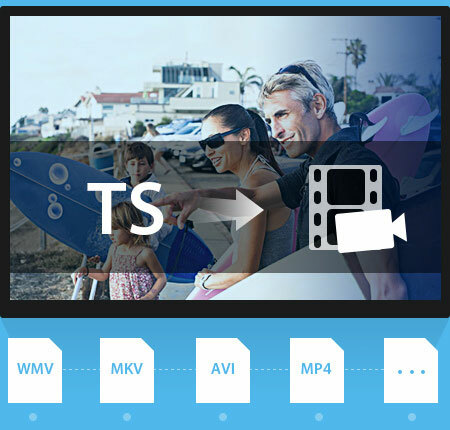 You are able to merge several scattered video segment TS into whole one for the long movie enjoyment by using this TS converter. You can trim video segment TS files you favor or remove unwanted parts by Trim function of Tipard TS converter. Either you can drag the two slider blocks by mouse, or set the start and end time precisely. 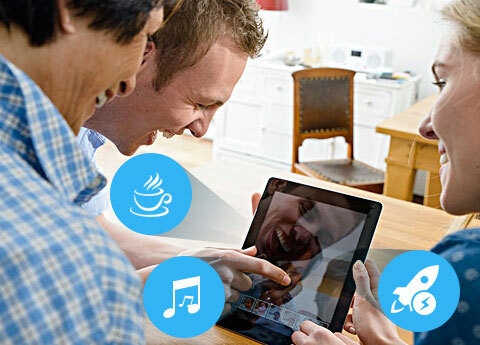 You can add your favorite picture or image on the video to make your video special. It enables you to customize the content of the watermark as you like. You can change the font-family, size, color as well as the pictures. You are allowed to improve your video effect by adjusting Brightness, Contrast, Saturation, Hue and Volume of the videos. You can set the output video parameters with this TS converter. You can set multiple output formats for one video at once. This software supports TS to convert one file to different formats simultaneously, which helps to make the conversion faster and easier. For video resolution, you can input your own one if the provided cannot meet your needs. Then the well-customized settings can be saved as User-Defined profile for your later use of directly choosing it. You are allowed to adjust more detailed video and audio settings, such as set video Encoder, Frame Rate, Video Bitrate as well as set Audio Encoder, Sample Rate, Channel, Audio Bitrate according to your preference. The clear and simple interface of Tipard TS Converter gives users so simple and clear operation that even beginners can finish the converting process within few seconds by following easy-to-understand guides. There is a built-in player within Tipard TS converter, which supports previewing the source video and output video at the same time. Thus, you can see the converted video effect more clearly. It is a wonderful TS converter which features CUDA technologies for the fastest video conversion. 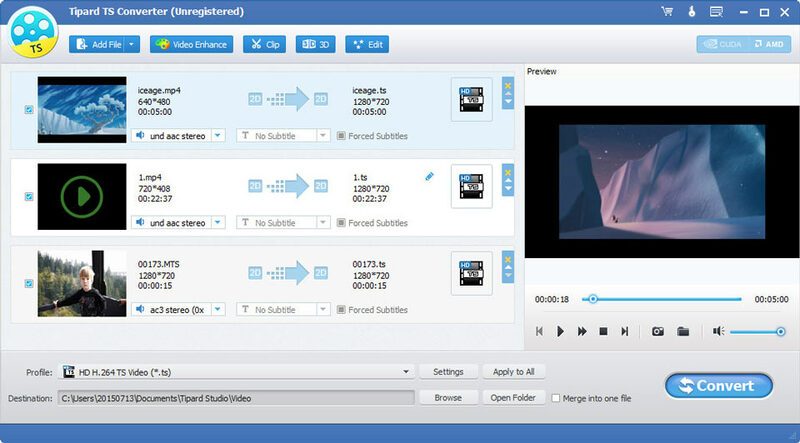 This TS Converter has a build-in video player, which enables users to preview videos and make snapshot during preview. You are able to merge more than more videos from DVD to one video with one click. Gary: I always record my children's happy moments by camera. And by using this ts converter, I can convert these files to my portable device compatible formats, when I am on business and missing my darlings, I can watch these files. Elizabeth: I can not only convert ts files to other various video formats, but I can extract my favorite audios from the videos and convert them to my device. I can enjoy the wonderful music anywhere. Kevin: It is the best TS video converter. It never fails to convert TS videos to other formats for my iPhone, and my husband's iPad. It is really wonderful!